Shetland: is a collection of about 80 islands with about the dozen of the largest being inhabited. It is the most northerly part of the British Isles and its Norse heritage distinguishes it from other Scottish islands. It has some great scenery, unique coastline and much natural wildlife and is a well known spot for ornithologists. See links page for more info... local links. to get information on local amenities. Video of boat trip to Noss. Video of St Ninians Isle. Ordnance Survey and Ordnance Survey of Northern Ireland. 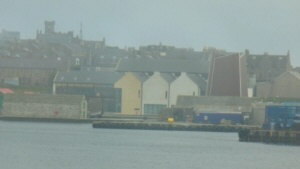 Lerwick - the only town and centre for services. St Ninians Isle - scenic isle joined by sand isthmus. Croft house museum at Exnaboe. Lunna Kirk - one of the oldest churches on Shetland. Mousa Broch - ancient pictish broch. Muckle Flugga - most northerly lighthouse in UK. St Ninians Isle is linked to the mainland by a tombolo of shell sand and is one of the best examples of its kind. The island is also known for the collection of 12th century silver which was found in the church ruin. A replica can be seen in the Shetland Museum. Mousa Broch - one of the best examples of its kind sitting 13m high on the uninhabited island of Mousa. Visitors can follow the narrow stone stairs to the top of the parapet. Mousa is easily accessible from the mainland of Shetland. Details on trips to Mousa can be found at www.mousa.co.uk. Muckle-Flugga, the most northerly lighthouse in Britain, was completed in 1858 and sits on one of the stacks off the northern tip of Unst - the most northerly isle of the Shetland isles. The picture was taken from Hermaness National Nature Reserve which is home to over 100,000 breeding birds. At the archaeological site of the Old Scatness Broch you can watch the past unfold with Living History demonstrations and guided tours. Open from May to August. Lerwick is the main centre for local government, shopping, recreational facilities and the port for the ferry link to Aberdeen. It has two supermarkets, sports centre, a swimming pool, two shopping areas and a theatre which doubles as a cinema. The latest addition to facilities is the new museum and archives shown which are at Hays dock on the waterfront. The Croft museum at Exnaboe provides an insight into rural life in Shetland up to the 20th century and features a traditional croft house, byre and barn. The house has flag stone floors and traditional open peat fires with furniture and articles from the time. Lunna Kirk is one of the oldest churches in Shetland still in use and was originally built in 1753. It sits next to another historic building Lunna House, which was the first operational base for the “Shetland Bus” during World War II. Boat trips around Bressay to Noss are available from spring to autumn and depart from Lerwick each day. The short video gives a sample of the sights.